IC Arizona: Come Join JD Supporters in three great rallies in Phoenix on Friday July 16 to help kick off the Senate Debate. AZ Right to Life State Conference - register now! David Schweikert for Congress: Momentum! Bill Montgomery - "RINO" Hunter! McCAIN'S NEW WORD FOR AMNESTY: "REGULARLIZE"
David Schweikert for Congress: It's Here! J.D. is on the Air - Help Keep Him There! 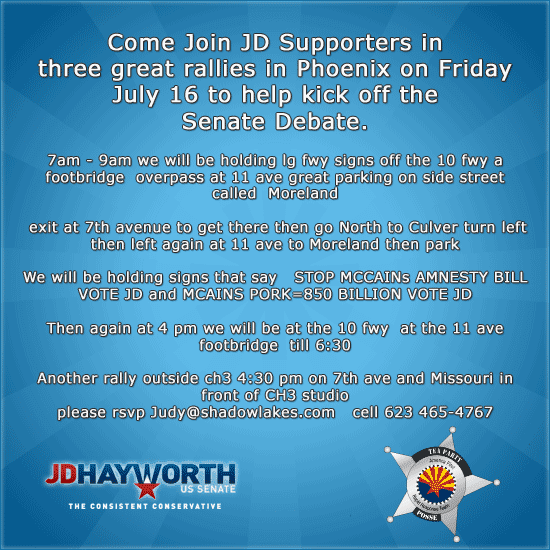 Come Join JD Supporters in three great rallies in Phoenix on Friday July 16 to help kick off the Senate Debate.